This entry was posted on 19/07/2012 at 21:23 and is filed under Animals, Conservation, Environment, Traveling. You can follow any responses to this entry through the RSS 2.0 feed. You can leave a response, or trackback from your own site. 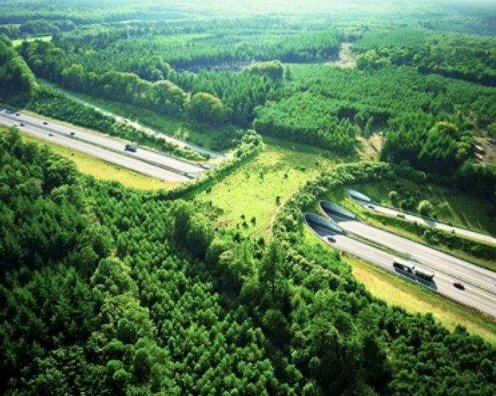 I think we have 5 or 6 of these wildlife overpasses between the Gold Coast and Port Macquarie on the Pacific Highway, connecting wildlife corridors. They’re designed mainly for Koalas which are facing extinction in some areas. Unfortunately 1 every 200km doesn’t help all that much. I’d like to know where that top photo is from? Might be an artists impression because the actual overpasses (as you’ve got pictured) aren’t as schmick looking. The aerial shot came to me via FB, where I’ve seen it circulated around quite a bit. Not sure where it’s from, but maybe someone will reply to this post and let us know. I doubt it’s Photoshopped – probably just a different continent, (Africa?). Certainly not the U.S. I’m curious as well. Thanks for the explanation on the koalas. Ykes – Good to know. Found it! Its over the A50 in The Netherlands. Cool, I wouldn’t have thought The Netherlands for some reason. The above top photo is of a bridge over the A50 in The Netherlands. There is another one about 10 miles south of this one on the same roadway.